I've had my grapewood vine in my tank for sometime now, and it's been doing fairly well in terms of how much mold grows on it- it comes, dies off- comes again, etc. but the growth really never gets out of control. While doing tank maintenance today I noticed these little tiny bugs crawling around on the wood. I haven't introduced anything new to the tank. I'm sure they're harmless- I haven't seen any on the crabs or the rest of the tank, only the grapewood piece. What could they be? Wood mites? They're super tiny, and the ones I saw varied from gray to red. I soaked the wood piece in SW just for safety! What shape were they? Mites are like little shiny balloons. Springtails are long and slim. My guess would be springtails if the mold hasn't gone crazy out of control, as they will directly eat it. I forget what shape they were..I don't think they were shiny though. Can they just come out of nowhere? Yes! Both will. It's not nice to think about, but they are always present in our homes in very small numbers. 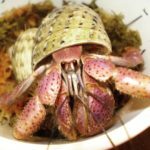 The crab tank is the perfect environment for them to reproduce though - heat, moisture, and lots of food - so they explode! Interesting! Next time I see them, I'll see if they're mites or springtails.